Please visit www.robotsinarchitecture.org for more information. This page is no longer being updated. 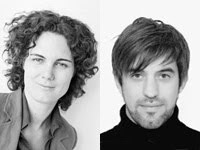 Sigrid Brell-Cokcan is one of the founding partners of II Architects int Istanbul/ Vienna. (Best design award at Turkey Build 2008 for Reinforced Prefabricated client: Alacali Construction Industry and Trade Inc.) Before launching her own architecture firm with Baris Cokcan she was working with renowned international architects and engineers Coop Himmelblau, Frank O Gehry, Peter Cook and Bollinger & Grohmann on projects such as Kunsthaus Graz, MARTA Herford and BMW World Munich. In 2006 together with Anita Aigner she has initiated and organized the annual conference of CNC Milling Technology in Architecture, Art and Design at TU Vienna, which has become an annual conference at TU Vienna.Since 2008 she is serving on the Scientific Committee of the international conference Advances in Architectural Geometry at TU Vienna. She holds a Master in Architecture (1998) from the Academy of Fine Arts Vienna (honoured with Carl Appel Prize), is a member of the Austrian Chamber of Architects and has completed international studies in architecture at University of Sydney (1994). Johannes Braumann is researching applications of industrial robots in architecture. He is a graduate of Master Building Science and Technology and fellow of the Austrian Academy of Sciences. Together with Sigrid Brell-Cokcan, he founded the Association for Robots in Architecture with the goal of making robotic arms accessible to the creative industry, organized Rob|Arch 2012, the first international conference on robotic fabrication in architecture, art, and design, and acted as co-editor of the Rob|Arch proceedings, published by Springer. He is the main developer of KUKA|prc (parametric robot control), a software tool for robotic fabrication and interaction which enables the accessible programming and simulation of robotic arms, directly within a CAD environment. His research on robotic fabrication has been presented at many international, peer-reviewed conferences, and published in research journals and books. In addition to teaching both technical classes and design studios at TU Vienna, Johannes Braumann has held robotic fabrication and Grasshopper workshops at international venues.